My wife and I saw Captain Phillips on Saturday. Yes, I have read the articles about the ways that the movie might not quite be fully accurate. But, it is still a great “business conversations starter” movie. 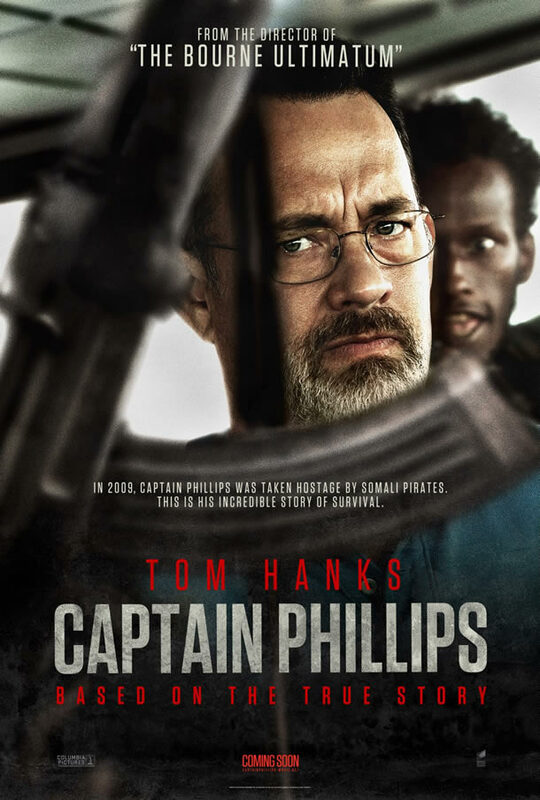 In case you have not seen it, it is based on the true story of the attack on the Maersk Alabama container ship by Somali Pirates. And if you want to read an interesting, apparently factual take on whether the film is accurate or not, there’s an article that breaks it all down pretty well. Always be on the lookout for the next dangerous threat—because, chances are, there is a next dangerous threat headed your way. In this case, the threat was really dangerous! But, every business faces threats from internal failures (or even internal laziness), external forces, lack of preparation, and from something simply going wrong. Many threats are not as “dangerous” as those posed by Somali Pirates, but there are still threats to the well-being of your business. Do not be surprised when they arrive. Try to anticipate them; try to prepare for them—because the threats are certainly coming! When you face a genuine crisis, your focus is pretty much shifted completely to dealing with the crisis. In the midst of a genuine crisis, a genuine threat that has arrived on your front door, nothing else matters until you deal with the crisis—the threat. So, that is where you put all of your focus. After the crisis, get back to work as soon as you can. I assume the ship got back to its work of transporting containers pretty quickly. And, at the end of the movie, in the “what happened next” lines of text on the screen, we learn that Captain Phillips did return to sea. It would have been understandable if he had never returned, but he did. I’ve got a hunch that that is the best strategy to move forward after surviving or facing down any crisis. There are certainly other lessons to be learned. The movie provides great discussion starters on preparation, checklists, team work, communication, etc. Good movie! One of the keys to being a successful mentor is to know how to leverage your experiences so that you can be of help to protégés. If you are being sought out as a mentor, it suggests that you are recognized as a successful leader. However, being a successful leader does not always translate into being a successful mentor. That requires developing a different set of skills and asking a different set of questions. It’s very helpful to consider how the protégé learns. Some people love to read studies, books, and scholarly articles that examine issues in a very thorough way. If your protégé learns well in this manner, then you will want to assign the right kind of reading. Other people prefer to read material that may only be indirectly related to their particular field because they are motivated to develop innovative approaches by connecting seemingly unrelated things. Providing new information is a key to being a good mentor, and the best mentors provide the right kind of information to the protégé. Another question to answer is, “What kind of instruction do they prefer?” Some people prefer to be given direction and other people prefer directions. Determining which way to go with this issue may be the single most important thing in being an effective mentor. If you are someone who prefers direction, you may find it very difficult to break everything down into step-by-step directions. If you prefer directions and you are working with a protégé who simply wants direction, you will have to be very careful not to micromanage things. Finally, pay attention to whether they are motivated more by logic or feeling. You can learn the answer by asking them to describe a satisfying result to a problem that they faced. If they describe the outcome as being one that made sense or improved a process, that’s a clue that they are motivated more by the language of logic. On the other hand, if they describe the result as being better because of how it made people feel, such as, “everyone was a lot happier”, then that is a clue that they are motivated more by the language of feeling. Mentoring can be a bit deceptive. You often become recognized as a mentor because of your own success, and that can lead you to think that you have reached the summit of learning. However, that’s not quite the case. Being recognized as a potentially good mentor is really an invitation to focus on learning a new set of skills. You can do it, but just remember that what got you here isn’t necessarily what will get your protégé there! How do people treat you? Are you constantly mistreated and undermined? Have you found yourself googling “how to demand respect”? Believe it or not, there’s a good chance that you are a large factor in your own poor treatment. My former co-worker is a great example of this. She would always complain about management being meaner to her than everyone else. She was a great colleague, but for some reason, she was never regarded in high esteem by the higher-ups. Finally, it hit me. This wasn’t a rare case—she’s the common denominator. There’s obviously something that she’s doing to contribute to how people are treating her. And there is. With every interaction you have, you’re teaching people how to treat you. Your reactions and responses build the boundaries for each relationship you have. Not setting such boundaries could evolve into you subconsciously becoming a pushover; and once that happens, it’s difficult to change that image. On the other hand, you also don’t want to build your boundaries so far away that people are terrified to interact with you. Doing that just makes you a bully. As I said, you are a large factor in your own treatment. The fault is not solely yours, but it’s important to know that you do have some control over it. Once you find a healthy balance of boundaries in your relationships—whether you’re the boss or employee—you’ll automatically have the level of respect you want (without having to google it). We’ve all seen the headlines: “Trust in government at all-time low” or “Declining number of Americans have confidence in government to fix problems” or “Government shut down—what next?” Like many of you, I’ve become numb to these headlines. One positive aspect to this otherwise depressing news is that the public’s confidence in local government continues to be vastly higher than their confidence in state or federal government. Gallup’s most recent poll, from September of this year, shows that 71% of those asked had a “great deal” or “fair amount” of confidence and trust in their local government to handle local problems. Compared to the public’s confidence in their state government (62%) and the downright dismal results of federal government (34%), those of us in local government should view this as a win. That being said, we increasingly face anti-government sentiment and frustration with government within our communities, and that can make local government work difficult. So the challenge is: how do you lead effectively amidst this anger, frustration, disgust, and unhappiness towards government? How do you change some of the public’s perception that government is cumbersome, ineffective, lazy and slow? I think the answer is in taking a bite-size approach. Attempting to change the public’s perception of government as a whole is an overwhelming and awesome task, but attempting to change one citizen’s interaction with the Parks Department when that person calls to rent a pavilion for his or her child’s birthday party is attainable. When you tell a resident you will provide an update on a problem you agreed to look into, keep your word and call back when you say you will. When there is a fair and ethical opportunity to cut down red tape for a business trying to open its doors in your community, take it. And, even more importantly, when you find out you cannot solve that resident’s problem, or that red tape is necessary and cannot be avoided, taking the time to deliver that message in a timely fashion can soften the blow of the “no” and build trust. When you build trust with citizens and clients, their opinion of you and your organization increases. Although what happens in Washington is largely out of our control, we can have a positive impact in our own communities on a daily basis. Each interaction with a customer is an opportunity to change how the public views their local government a little bit. As local government professionals, we know that the vast majority of public employees are passionate, committed, and highly skilled. Let’s give the public more reasons to have trust and confidence in their local government. 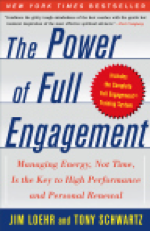 The Power of Full Engagement: Managing Energy, Not Time, is the Key to High Performance and Personal Renewal. You will run short on energy. You will, at times, run out of energy. And then, you need to build your energy back up—to replenish your energy. If you try to accomplish something meaningful when you are practically out of energy, it will not work out very well. Let’s call this a “law.” It is a law of human life, and it is certainly a law of productivity. Energy management is probably a new skill for this era of ever-increasing productivity expectations. The problem in today’s competitive environment is that we need to replenish our energy as quickly as possible because there is always the next project to tackle, the next assignment to fulfill, or the next new thing to get to immediately. And when we go directly from one energy-expending task to the next, we don’t have time to replenish as we should. Use it nearly all up! replenish it for the next challenge. use it nearly all up again. Are you spending your energy to the point of being “spent” occasionally? If not, you may need to become more productive. It’s probably a good thing to “spend it all” on projects that are worthwhile. Do you try to keep going without replenishing your energy? If so, you are headed for real problems. You’ve got to replenish your energy, or ultimately, you won’t have energy left to use at all. Principle 1: Full engagement requires drawing on four separate but related sources of energy: physical, emotional, mental, and spiritual. Principle 2: Because energy capacity diminishes with overuse and with underuse, we must balance energy expenditure with intermittent energy renewal. Principle 4: Positive energy rituals—highly specific routines for managing energy—are the key to full engagement and sustained high performance. As some of you may have already read through other SGR publications, it’s been a rough week for the SGR team because Laurie Groover, our finance manager, passed away on Monday after a hard-fought battle with cancer. Although she’s not here physically, her attitude is something that can never be forgotten. Let me elaborate. Laurie was seriously the nicest person I have ever met in my life. Not that kind of nice that can be turned on or off—she had a genuine gentle spirit about her. When you talked to her, you automatically changed your demeanor because she was a calming soul. Even going through chemo and losing her hair, she kept a positive attitude. Seeing her optimistic spin on anything in the workplace, and in life, changed the way others viewed things. That’s the legacy she left. If you were no longer working for your organization tomorrow, or if one of the employees on your team resigned, what’s the legacy you would leave behind? What would people have to say about you? Taking too long to answer the question may mean that you have some things you need to work on. It doesn’t have to be earth shattering. I still remember the teacher who stayed until 8 p.m. helping me go over pre-calculus math problems, the boss who acted just like a coworker and took over people’s shifts, and the neighbor who would mow our lawn whenever he mowed his. These things weren’t monumental, but they were still memorable. So, with every person you encounter daily—coworkers, citizens, clients, etc.—what gesture are you making that is leaving a fingerprint in that person’s life? What will be remembered about you? It’s one of the few things in life you can actually control.